Your wickedly good Fish, Shrimp, & Lobster deserves to be gilled to perfection! Try this mouth-watering seafood rub from Dean Jacobs. You'll be amazed at what a great rub can do for seafood. 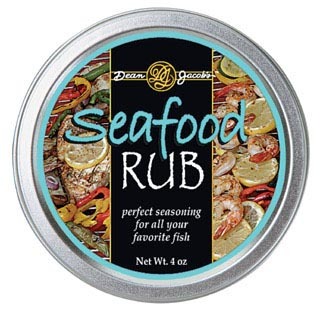 Dean Jacob's Seafood Rub, is loaded with flavor to make the most of your grill meats. Bring out a bouquet of flavor for Fish, Shrimp, & Lobster. Oil meat lightly, liberally apply the seasonings and massage into food. Grill, broil, roast or fry as usual.